Statements by SCi : The cars in TDR:2000 will have modelled e.g. 3D cockpits that you can see into from the outside AND a cockpit overlay, with windscreen wipers. Torus Games, a Melbourne-based software company, are the developers of Carmageddon  The Deathrace 2000. Torus has promised this third instalment, which has the working title of Carmageddon  The Deathrace 2000, will represent a complete overhaul. The companys own sophisticated 3D graphics engine is to be used, delivering smoother and more realistic images. Car handling and collisions are also set to become more life-like utilizing Toruss own advanced physics code in the game's physics system. "Deathrace 2000 will look and feel considerably different from its predecessors." enthused Bill McIntosh, founder and managing director of Torus Games. "Without going into specifics, all key elements are being totally redesigned, and a number of new features introduced to keep the concept fresh and original." added Mr. McIntosh. The Death Race 2000 is the next title in the stunning, award winning, Carmageddon™ series on PC. However this is not just a sequel! 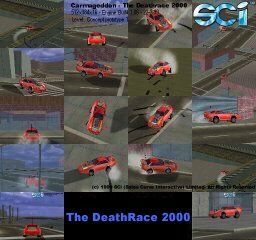 Carmageddon:The Death Race 2000, has been developed with world leading technology with the focus of the game centred round fast action gameplay in a completely new 'immersive' environment. An environment which is far more advanced than in previous Carmageddon games. The humour of the game surpasses that of previous releases, and at last the introduction of homicidal Zombies! The time has come for the victims of Carmageddon and Carmageddon 2 to get their revenge after 3 long years of suffering at the hands or should we say the bumpers of Max and his psychotic co-drivers. In short, nothing like this has been seen before... Over the last two years, SCi has been working on a next generation racing engine. Already Carmageddon: The Death Race 2000 engine achieves twice the frame rate as Carmageddon II on the same hardware. Combined with an all new revolutionary physics engine, this title is set to redefine racing games - on any PC! Carmageddon: The Death Race 2000 will also be the first in the Carmageddon series to be designed from the ground up for on-line Internet playing. 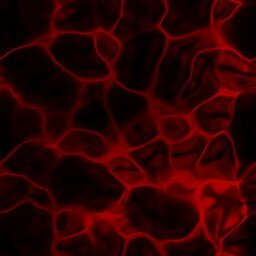 With unique on-line arenas and play modes, this game is going to keep those telephone lines engaged for hours! And of course these levels will be full of highly charged AI computer players whose only purpose in life is to see you smash crumple and burn. A massive 45 races across 15 environments, including missions +15 death match arenas! This game is HUGE! For the first time ever, players will be able to customise vehicles and pedestrians from the start of the game (e.g. car colours and decal). By improving the AI system, it will be possible to enjoy the same gameplay in single player mode as in the highly popular multiplayer mode. A busy environment will give players a lot more to interact with. Animated props such as working cranes and other environmental features will allow the staging of traps and stunts etc. making it more dangerous for drivers. Smaller more detailed environments so there's a lot going on and players can't get lost. Aggressive Zombies who are engaging in tasks within the environment. For the first time they will be crossing the road, standing in groups etc. There will also be aggressive bandit cars for those intense car chase experiences! Car parts from intelligent drone vehicles, that can now be destroyed and damaged, will litter the highway. You can see twice as much action on screen due to greater drawing distances. Fully implemented particle system for dust, debris and giblets etc! An in car view, which includes a rear view mirror, that will allow the player to see all the debris on the windscreen. It will even have a working windscreen wiper! New lighting features mean that cars and buildings will cast hard shadows on walls and floors of each environment, as well as having indoor lighting from multiple light sources. Advanced reflection system, means that cars with metallic paint and buildings with windows will show realistic reflections. Stunning graphics with high-resolution texture mapping. At least double the frame rate of Carmageddon II on the same PC, offering around 30 frames per second as an average. Multiple resolutions from 320x400 to 1280x1024 at 16, 24 & 32bit colour depth. Force feedback support with DirectX and Iforce. 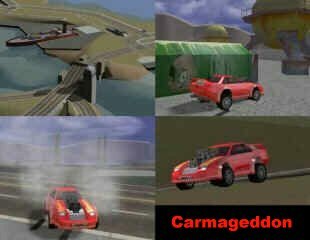 Intelligent loading program - Carmageddon: The Death Race 2000 engine will detect the processor and 3D card of the player's system and adjust its feature accordingly. This means they will ramp up features for the high end PCs and automatically reduce them for the low end PCs. Multiplayer over LAN and Internet. Minimum Specs: P200 with DirectX 6 and upwards.